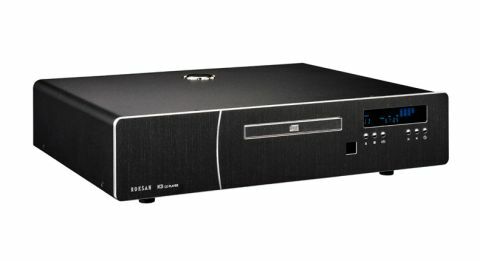 Roksan K3 CD Di review | What Hi-Fi? Granted, a cane and a top hat won't make you Fred Astaire, but some hi-fi gear does just look the part. The Roksan K3 CD Di is some such hi-fi. Thankfully, Roksan has considerable previous for designing products that play the part as well. The Caspian M2 (£1900), for instance, has a mantelpiece full of What Hi-Fi? Awards, and we aren't expecting this to be far off the pace. A CD player with digital inputs, the CD Di joins the K3 range alongside its sole-purpose CD player and the five-star rated K3 integrated amplifier. Roksan suggests its ability to perform solely as a DAC makes it a one-box “audiophile hub”. (The Caspian M2 doesn't have the digital inputs of some of its competitors. This does, and is capable of handling data streams up to 24-bit/192kHz). From the opening call and answer of Beethoven's Piano Concerto No3 in C Minor, played by the Scottish Chamber Orchestra, our visual impression is affirmed. It's a matter of character: the instruments sound rich, are well organised and set in a magnificent amount of space, but it is the purpose in their voices that sets the K3 CD Di apart. The sound is confident in its attack – but rendered sympathetically enough, as if aware of itself, so as not to become overzealous – and great expressiveness in its dynamics makes the piece feel like a conversation between instruments. Next we try a piece with vocals, Sigur Rós's Í Gær. The music box-like glockenspiel and organ introduction elegantly showcases the rhythm and organisation of the K3 CD Di, building eerily with a dreamily off-kilter dance until the snare interrupts like a gunshot. You may find some rivals have a touch more rhythmic drive and precision, but there is a confidence in everything else Roksan does that’s impressive. Jonsi's voice is full of magisterial triumph. While full-bodied, with enough of a platform to stand out, it isn't thrown forward or separated from the rest of the instruments. The K3 CD Di lets the vocals soar along with their accompaniment, baring its intensity with a natural effortlessness. That said, we're less-than-surprised to hear a voice befitting the character Roksan has emitted from everything else we've heard on this CD player. After a number of rather sweeping compositions, we lighten the load with Nick Drake's Cello Song. It sounds muscular, but delicate; the finger-picking is faultlessly rhythmic on the acoustic guitar, the skin drum pops, the cello mournfully sings and Drake's voice cherishes its fragility. A tricky live recording, Miles Davis's Spanish Key, is no problem for the K3 CD Di either. The sextet avoids disorder, allowing the jazz and funk rhythms to fuse, keeping its head above water despite the piece's avant-garde improvisational style. Anyone spending more than a grand on a CD player, albeit one capable of being used separately as a DAC, probably isn't doing so with the idea of upgrading in the near future at least. That’s why, when we award the K3 CD Di five stars, we’re happy it’ll keep you satisfied for a long time. There are plenty of players at this price offering sound-per-pound scale and detail, but few are so musical. Roksan has again designed a product promoting the character of what it’s playing, regardless how subtle or opaque that character may be, and that’s why you’ll never tire of listening to it.